THE IRISH FARMERS’ Association (IFA) has strongly criticised a proposal by the Department of Agriculture to dump almost 100,000 tonnes of fine peaty silt in Donegal bay. They say the move will harm millions of fish and shellfish stocks along the north-west coast, cause damage of up to €50 million and threaten 150 jobs. Speaking to TheJournal.ie, local councillor Niamh Kennedy said initial proposals from the Department on the matter appeared satisfactory in addressing locals’ concerns, but no one wants to see job losses or fish stocks lost. 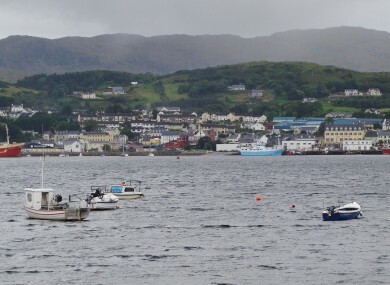 At the end of November, the Department submitted an application to the Environmental Protection Agency for capital dredging at Killybegs harbour. On the application, it is said the dredging will cause almost 100,000 tonnes of materials to be disposed of at sea. All of the materials related to the application can be found here. The IFA’s executive of aquaculture, Richie Flynn said: “We are all in favour of coastal economic development and the extension of facilities in Killybegs which require dredging. Flynn added that the level of monitoring detailed in the proposals is “totally inadequate”. He also said that the peaty nature of the silt has not been taken into account by the department, and called their dispersion models “out of date”. This material will drift and spread throughout the bay, potentially causing damage to up to €50 million of our stocks and threatening 150 jobs. The IFA is urging for an alternative site to be found far away from any fishing areas. Flynn said: “The proposed site was the subject of a report which could not show definitively that dumping spoil in that area was not responsible for the death of 2 million fish in 2003. To return to this site now to re-commence dumping is highly irresponsible, especially with such volatile material. He concluded that the independent monitoring is carried out to ensure no toxic material is carried out in the bay. Independent councillor Niamh Kennedy said that she had received assurances from the department that no contaminated material will be disposed of at sea. “We need to find the facts here,” she said. Currently, there is no date listed for the expected decision from the Environmental Protection Agency. TheJournal.ie has contacted the Department of Agriculture, Food and the Marine for comment on the concerns raised by the IFA. Email “'Highly irresponsible': Dumping of almost 100,000 tonnes of silt in Donegal bay criticised”. Feedback on “'Highly irresponsible': Dumping of almost 100,000 tonnes of silt in Donegal bay criticised”.